The EasyShed Gable Slider garden sheds are designed with sliding doors and a gable roof. Perth is limited to a 20km Radius due to freight constraints. 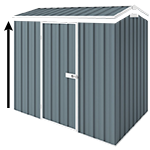 Our EasyShed garden sheds represent a fantastic value Australian made range of garden sheds. The EasyShed Gable Slider garden sheds are designed with sliding doors and a gable roof. This model is a great shed for small backyards or if you only have minimal storage needs. This is the colour steel model so you can choose a colour to compliment your home. Ideal for a: Garden shed, potting shed, tool shed or storage unit. The sliding door is what makes this model unique. It allows easier access especially if the shed is in a tight alley or crowded spot because the doors don’t have to open outwards. Gable Sliders come with doors on gable end and off white trim overhead. Assembly is DIY and you will receive the manual with your kit. You are recommended to assemble this product with 2 or more people. NOTE: All Durabuilt/EasyShed Colour products come with Off White Channels / Trims. *Please note: Standard wall height is 1.8m, there is no extra height option for skillion roof models. EasyShed Garden Bed 0.75m (w) x 0.50m (h) - Explore your green thumb by attaching a Garden Bed to your shed (same colour as selected shed). Free standing shelving 800mm (w) x 300m (d) x 1500mm (h) - Australian made, galvanised steel, 300kg unit load, adjustable shelf heights, no nuts or bolts required. Anchor Pegs - Set of 8 pegs to anchor your shed to soft surfaces. Concrete Fixing Kit - Set of 8 anchors to anchor your shed to a concrete slab.